Cyber threats are becoming increasingly sophisticated, targeting everything from your inbox to elections, and Canada sees its fair share of them. Between 2011 and 2015, the percentage of total cyber attacks targeting small organizations – in Canada, 98 per cent of businesses in Canada are small businesses – increased from 15 to 43 per cent of total attacks. These types of attacks can cause serious damage to less secure websites such as public libraries, municipalities and school boards. 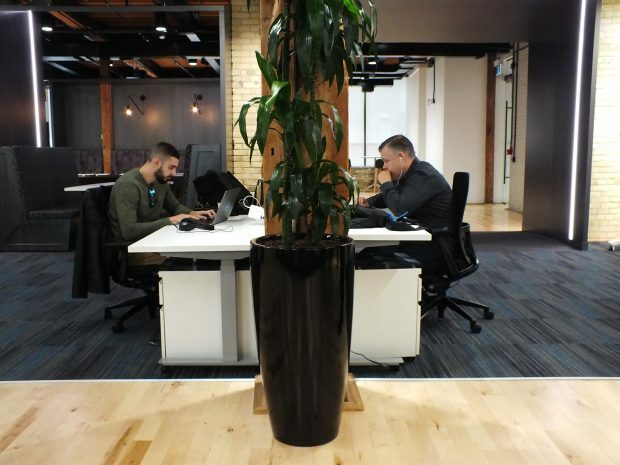 In collaboration with Telus, International cybersecurity company Trend Micro has set up a new research lab in Toronto, hoping to not only get ahead of the next wave of cyber threats, but closely study the ones we’re battling today and collaborate with the bustling tech community to safeguard Canadian infrastructure. Trend Micro has four other offices across Canada, which serve as additional research and marketing centres. 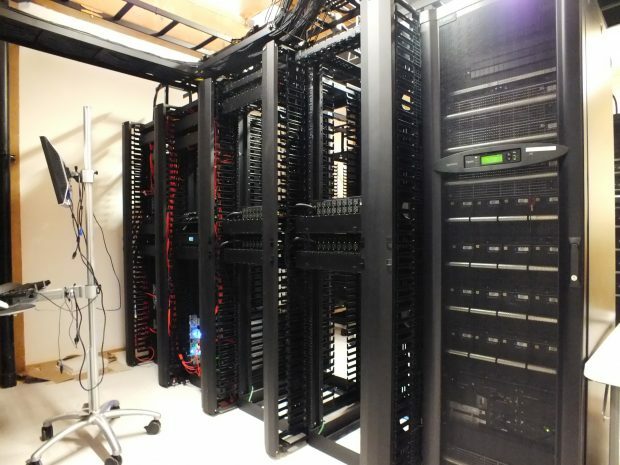 We recently got a chance to tour the 22,000 square-foot research centre located in Liberty Village. Pictured above, from left, Trend Micro’s Marcia Sequeira, vice-president of Canadian sales and marketing, Bill McGee, senior vice-president of hybrid cloud security, and Mike Gibson, vice-president of threat research. All photos by Alex Coop. 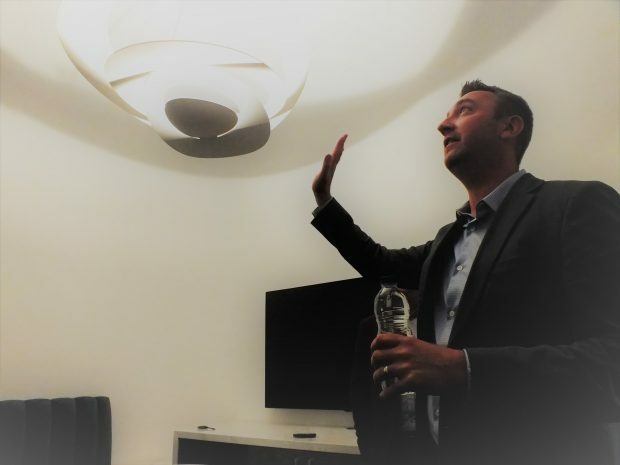 In addition to research, Trend Micro wants its newest building to serve as a centralized space for the company’s partners and customers. 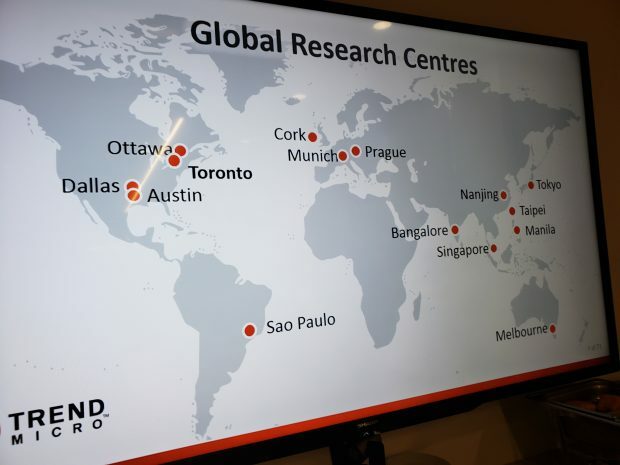 Marcia Sequeira, vice-president of Canadian sales and marketing for Trend Micro, says the research centre is the perfect place for training sessions, demonstrations and networking. Visitors walk on Canadian Maple floors and are surrounded by some greenery, giving the multi-purpose open space a refreshing, relaxing feel. Trend Micro’s chief technology officer, Raimund Genes, was not only passionate about threat research, but was an avid pinball fan. After suddenly passing away last year, Trend Micro made sure to honour Genes with a small tribute at its new research centre. Two pinball machines grace the floors of the new office, representing Genes’ love for the game. 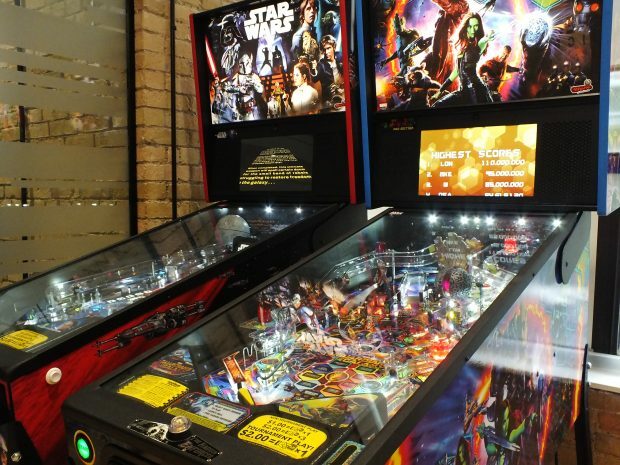 Trend Micro execs recalled the joy on his face upon visiting a pinball museum during a tech conference in the U.S. If you there’s an opportunity to install a secret room in your office – take it. Pictured above, Mike Gibson, vice-president of threat research, shows off the all-purpose secret room. Gibson says the room was ideal for demonstrations and training sessions, especially when other rooms were occupied. Of course, he adds, it also makes for a great karaoke space. In order to study threats, you need a place to safely deploy them. That’s what these servers function as. Researchers detonte malware on them – which are obviously segmented from the company’s corporate network – and play around with the malicious code to develop new tactics and solutions to combat similar threats. A 200-person team in Ottawa heads a global operation that provides cybersecurity for cloud computing. Trend Micro has also acquired a Montreal firm that does research into AI and machine learning. This type of work continues across the company’s more than a dozen research centres across the world in Tokyo, Munich, Prague, Sao Paulo and Austin, Texas. Sequeira says that by the end of the year, Trend Micro is planning to hire at least 500 new people, 50 of which will remain in Canada. In total, Trend Micro has a workforce of approximately 6,000. Pictured above, vulnerability and malware researchers hard at work. The tour was capped with a brief presentation about the latest trends in the cybersecurity space. Approximately 83 per cent of cyber threats blocked by Trend Micro are found in emails. Only 14 per cent of them come directly from individual files, and only 2 per cent come from URLs. Ransomware continues to be a popular avenue for attackers to earn money, but cryptojacking is rapidly rising in popularity. According to Symantec’s 2018 Internet Security Threat Report, cryptojacking attacks have exploded by 8,500 per cent in the past year. 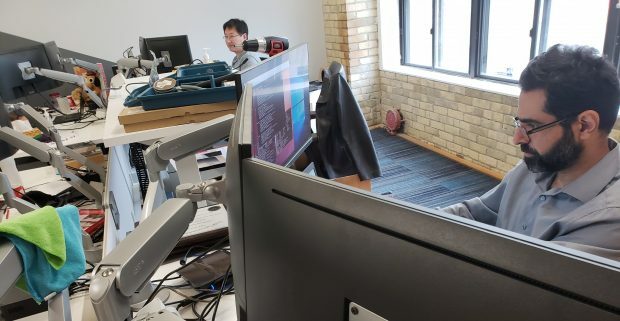 But experts during the presentation explained that the most sophisticated cyber attacks in Canada account for only about 1 per cent of all threats – it’s the near-decade-year-old legacy viruses that continue to cause problems, especially for SMBs with outdated security software. Trend Micro says overall, it’s blocked more than 66,400,000,000 threats since its inception. September Community Slideshow: It's Back to School! Did you buy a new device for your child?